Installation view of Belén Uriel at Madragoa's booth. It’s this time of the year again, when the international art worlds descend onto Miami for a week of champagne-fueled parties and events. 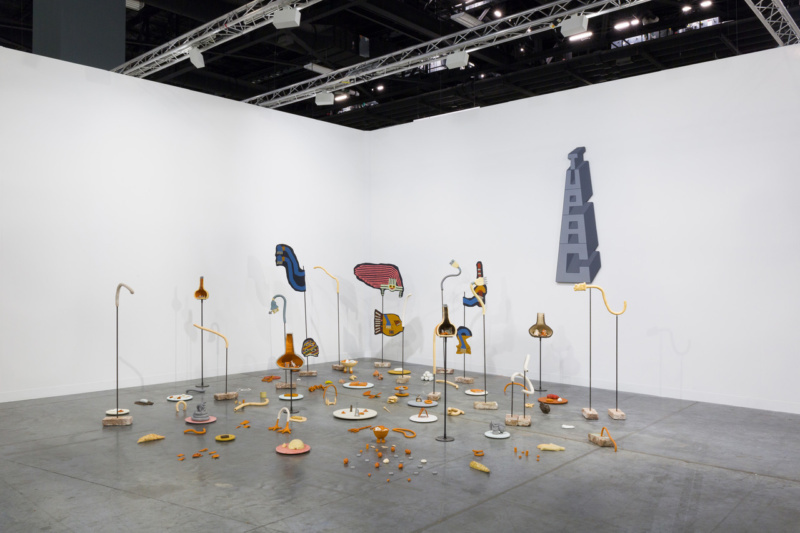 At its heart, Art Basel Miami Beach opened its 17th edition, this year featuring over 200 contemporary and modern art galleries. While the main section feels a little loud—as many fairs do—a number of solo booths really make the trip worthwhile. Here’s a breakdown of the best ones. The Lisbon-based, Spanish artist Belén Uriel presents a new series of sculptural works, made of brass and glass casts. They are inspired by the relationship between human anatomy and objects and look, well, visceral. The two central pieces derive from the cardboard interior of a medicine box, designed to hold glass falcons. 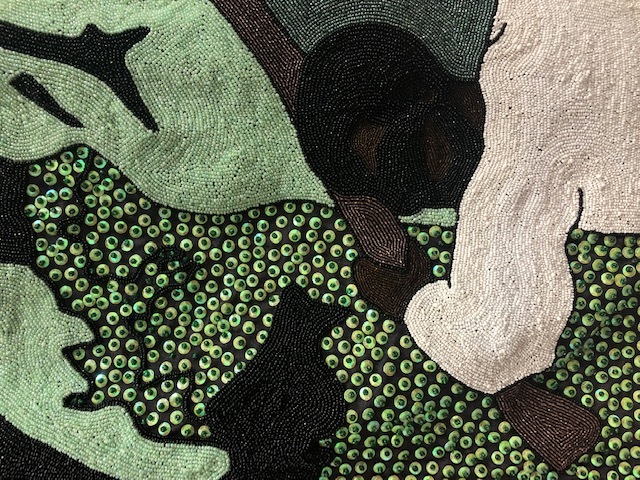 Detail from Kapwani Kiwanga’s Nations, 2018. Courtesy of Galerie Poggi, Paris. Paris-based, Canadian artist Kapwani Kiwanga isn’t short of attention these days. After being awarded the inaugural Frieze Artist Award 2018 in New York and the prestigious Sobey Art Award 2018 in Canada, the artist presents a series of new works in Miami, as she prepares for a solo exhibition at MIT List Visual Arts Centers. Inspired by Haitian voodoo, “Nations” is a project that Kiwanga first imagined during a residency on the island in 2009. 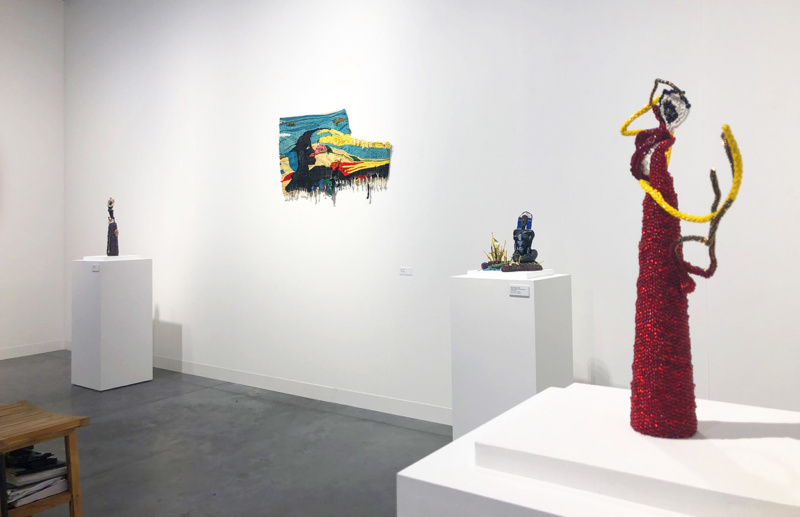 The three, crafts-influenced sculptural works are made of beads and sequin fabric flags, and we can’t get enough of them. Installation view of Feliciano Centurión at Walden Gallery’s booth. Too often overlooked, the work of the late Paraguayan artist Feliciano Centurión feels at once so historically significant and current. Most active in Argentina, where he relocated with his family in the 1970s, Centurión was a central figure of the 1990s Buenos Aires art scene, particularly the “Grupo del Rojas” (a group of artists concentrated around the Cultural Center Ricardo Rojas). He is best known for his naive works that incorporate plastic toys, glitter and cheap bijouterie, often alluding gender and sexual identities, at the height of the AIDS crisis. 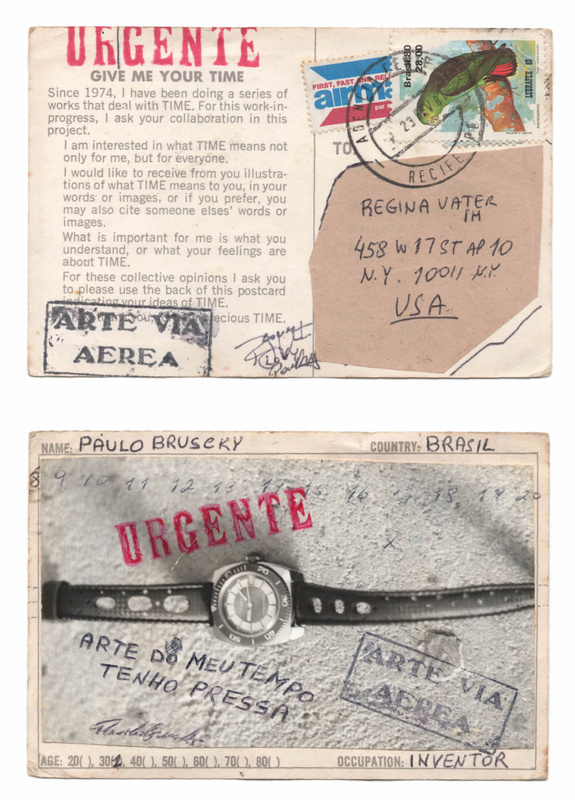 Postcards from Regina Vater’s Give me your time, 1981. 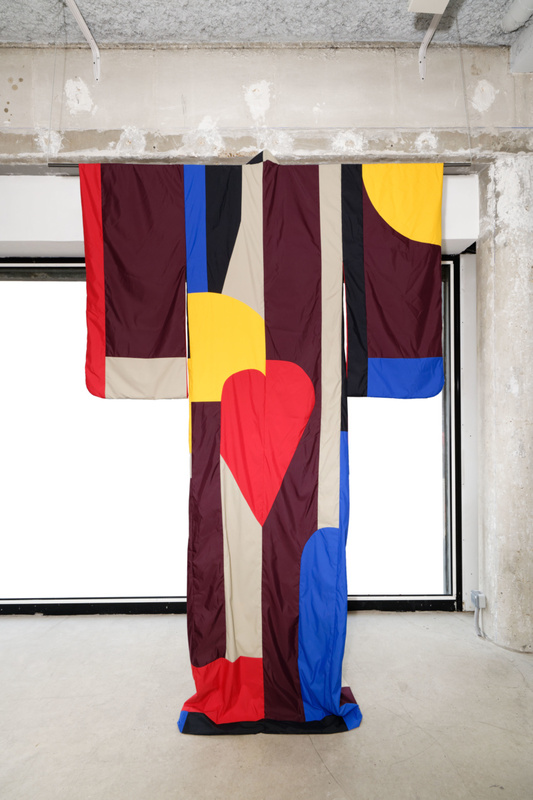 Pia Camil’s They’s Tunic, 2018. Courtesy of the artist and Instituto de Visión. Claudia Martínez Garay’s ¡Kachkaniraqkun! / ¡Somos aún! / ¡We are, still!, 2018. Freshly graduated from Amsterdam’s Rijksakademie, Peruvian artist Claudia Martínez Garay is everywhere since her notable participation at this year’s New Museum Triennial. Her work is invested in Pre-Columbian cultures, with a focus on the visual language of Incan ceremonial traditions. Here, her excellent solo booth presents a number of ceramic works of all shapes and sizes, standing sculptures and murals—a real cabinet of curiosities. Since the 1970s, Baltimore-born artist Joyce J. Scott has been known for her figurative sculptures using free form bead weaving. 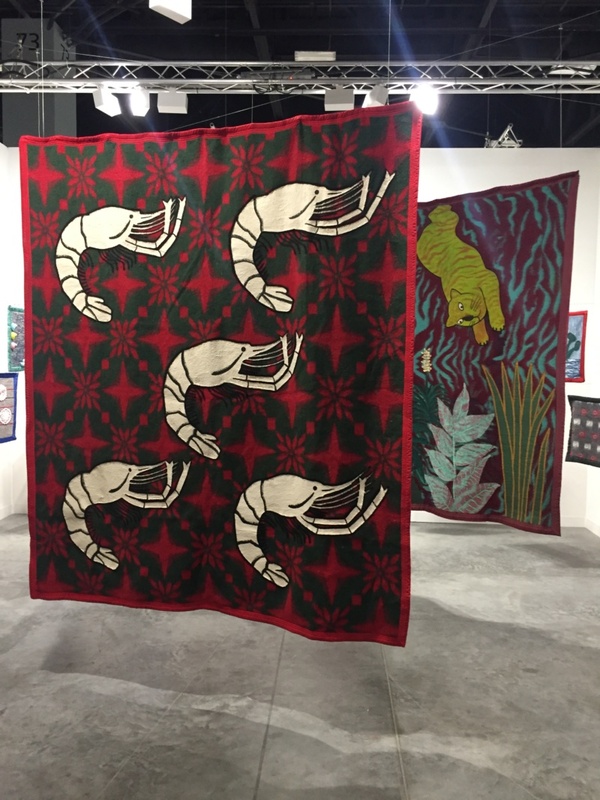 Her work bridges the gap between craft aesthetics and spiritual traditions, including influences from West African Yoruba weaving techniques, Native American and transcendent Buddhist belief systems. But most importantly, it evokes Southern traditions of quilting and beadwork, which are deeply rooted in her own family history. The booth focuses on a series of rarely seen, early works, which explore issues of race, gender and violence. Larry River’s Me and My Shadow IV, 1970. An accomplished Jazz musician, painter, sculptor, poet, actor, television personality, filmmaker, an MC at nightclubs, the influence of the late Larry Rivers is uncontested. The focus of the booth is the sculptural series Me and My Shadow, which consists of larger-than-life size mirror images of female figures and their shadow, all made in 1970. 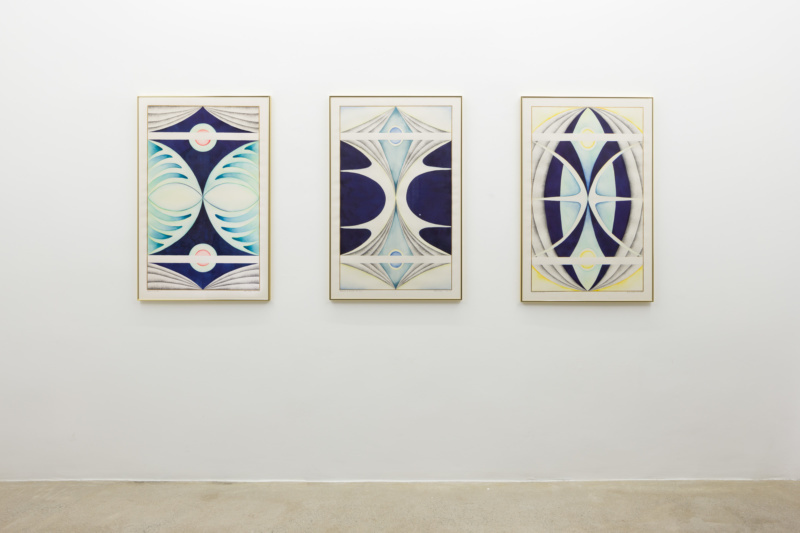 Faith Wilding’s Moth Triptych, 1974. 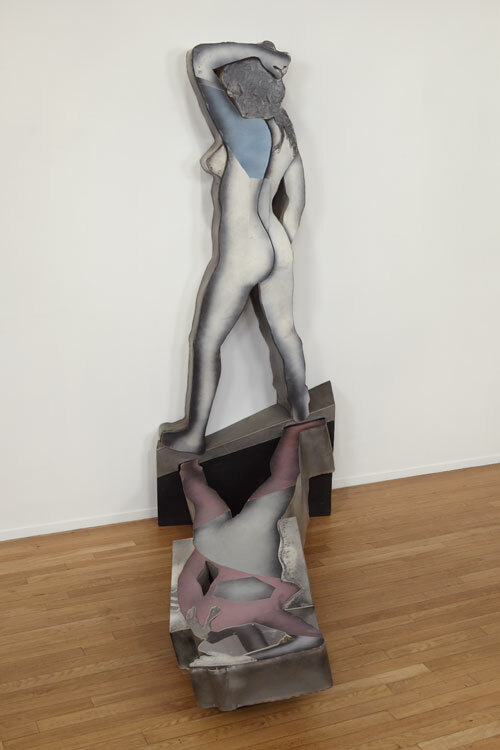 Faith Wilding may not be as popular as her peer Judy Chicago (whose excellent survey just opened at the ICA Miami) but her body of work is equally significant. As an early radical feminist, Wilding was a co-initiator of the Feminist Art Programs at Fresno State and CalArts, a founder of the Woman’s Building, and a participant of the seminal “Womanhouse”exhibition. The booth focuses on specific works from the 1970s, including paintings and works on paper that reference the botanical and metaphysical: floral buds, leaves chrysalises, insects and bodily metamorphoses. But the real treat here is a video documentation of Wilding’s disturbing performance Waiting—a repetitive, poetry exercise that addresses the female experience from birth to adolescence, wife to motherhood to death, interpreted through a position of inherent longing. 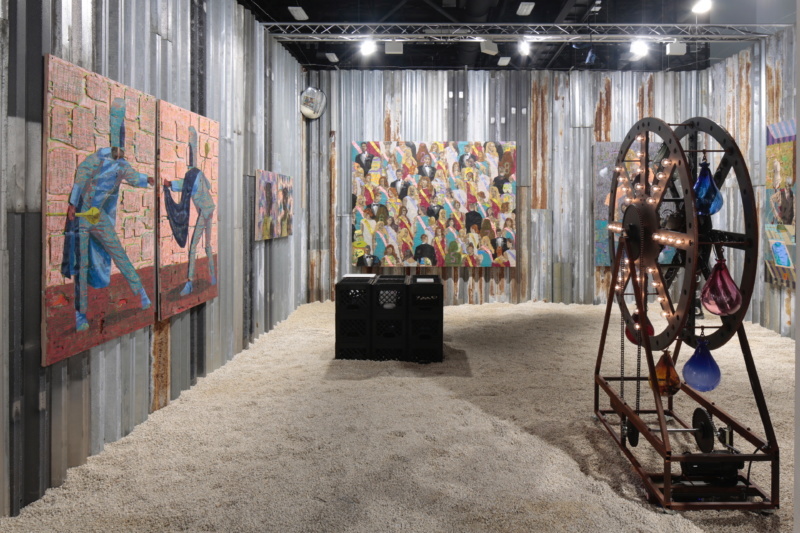 Installation view of Derek Fordjour’s solo booth with Josh Lilley. Now this is a real immersive booth. Backroom, by Memphis-born, New York-based artist Derek Fordjour, is a site-specific installation that transforms the clinical, austere feel of Miami’s convention-center into a shanty-styled stockroom. Fordjour recontextualizes a space of dealmaking and display by building up a typically pristine interior with locally sourced materials, including loose pea gravel and corrugated steel. The space features the artist’s lush, textural portrait painting and a large kinetic sculpture.